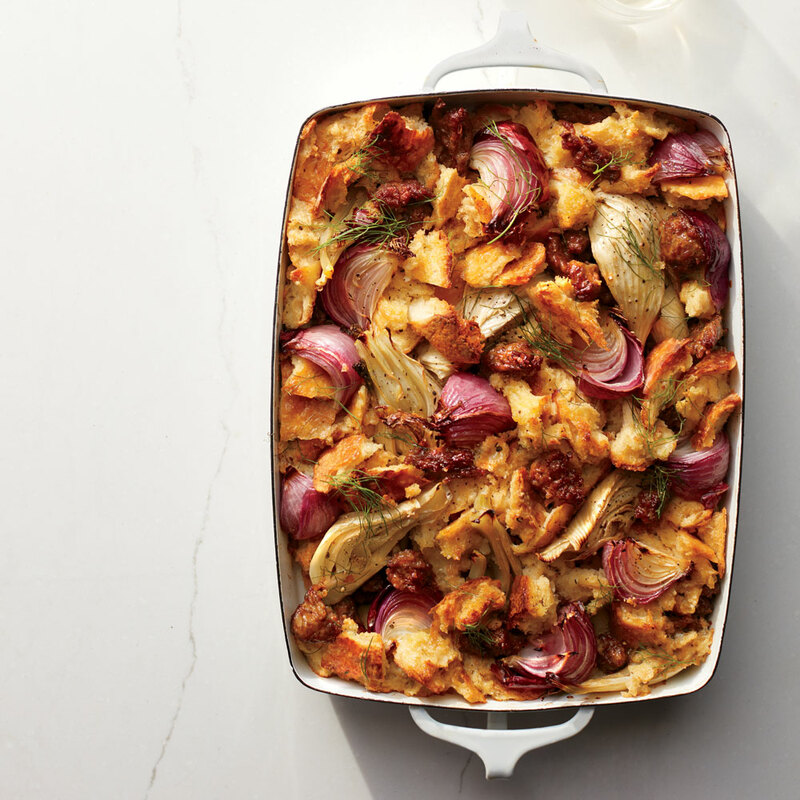 Wedges of fennel and onion meet chunks of sweet Italian sausage in this textural, satisfying stuffing. A quick homemade sausage laced with red wine and fennel seeds is an optional upgrade for added flavor (see Notes). Preheat oven to 375°F. Grease a 13- x 9-inch baking dish with butter, and set aside. Place sausage, fennel, onions, and thyme in a single layer on a large rimmed baking sheet. Drizzle with oil, and sprinkle with 1 teaspoon salt and 3/4 teaspoon pepper. Bake in preheated oven until browned and softened, 20 to 25 minutes. Set aside. Place bread in a single layer on a rimmed baking sheet, and bake at 375°F until very lightly toasted and dried out, 15 to 18 minutes. Let cool 5 minutes. Whisk together eggs and chicken stock in a large bowl. Add bread, sausage mixture, remaining 1 1/2 teaspoons salt, and remaining 1/4 teaspoon pepper; stir well. Scrape into prepared baking dish. Cover tightly with aluminum foil; let stand at room temperature 45 minutes. Bake, covered, at 375°F until heated through, about 40 minutes. Uncover and bake until lightly browned, about 30 more minutes. Let stand 10 minutes; garnish with fennel fronds, and serve. DIY Italian Sausage: Combine 1 pound ground pork, 3 tablespoons red wine, 2 minced garlic cloves, 2 teaspoons fennel seeds, 2 teaspoons kosher salt, 2 teaspoons freshly ground black pepper, 1/4 teaspoon cayenne pepper, and 1/8 teaspoon ground allspice in a stand mixer fitted with the paddle attachment; beat until well blended. Cover with plastic wrap, and refrigerate 30 minutes before using.